With levels of course, not that one level unblocked crap. 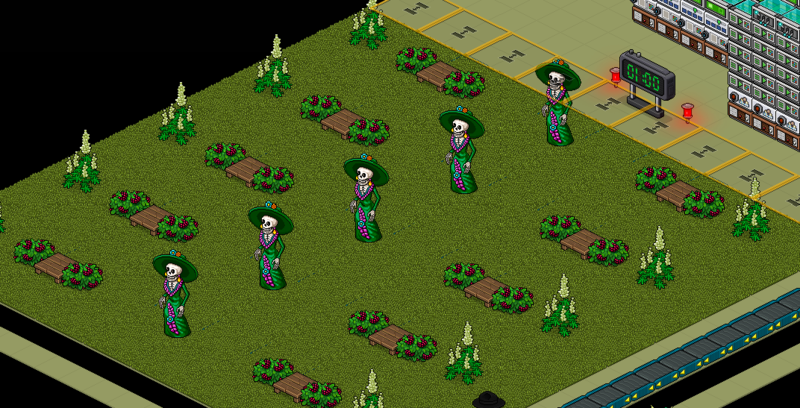 • When catrina is approaching you, type JUMP to jump over the item. • There will be 4 sets of 1 minute rounds, each round the item gets closer to you. • To win survive all 4 rounds. 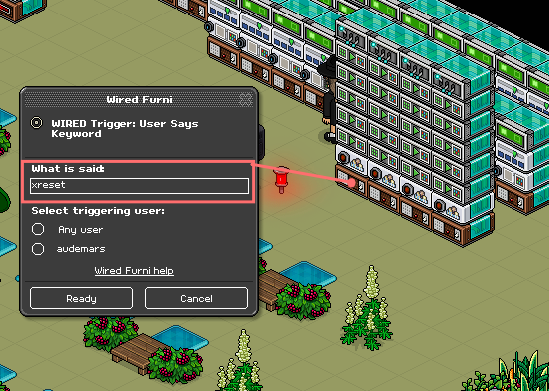 This tutorial will teach you how to wire it to a semi-auto hosting state, using wired commands to set up each round. Note that there can be multiple winners reach game. Anyone that survives all 4 rounds is a winner. 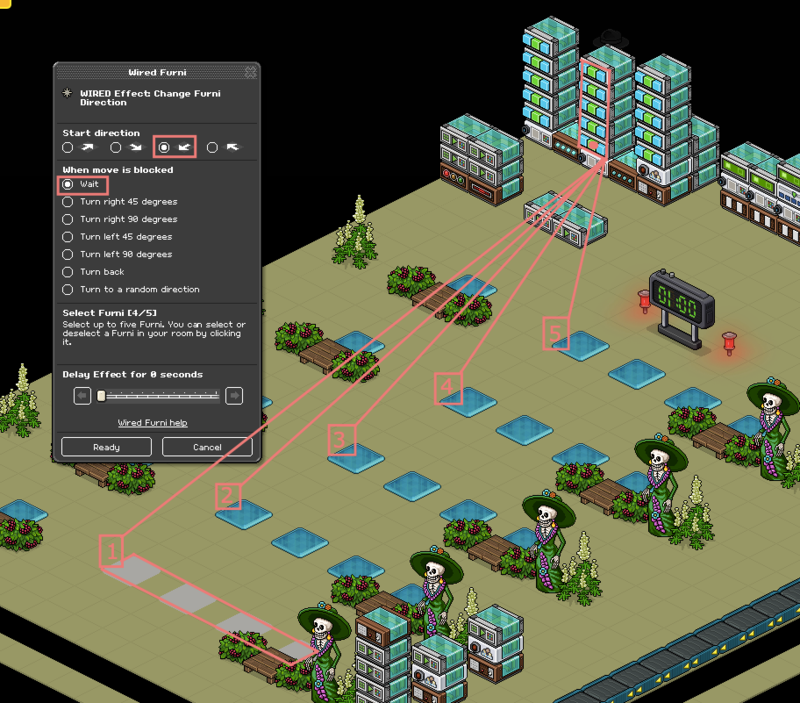 This is an all out effort to wire, if you want the game to work smoothly you need to put in 100%. I've written the guide as detailed as I can, good luck. 2. Once level 1 is over - type x2 for level 2 to start. 3. Once level 2 is over - type x3 for level 3 to start. 4. Once level 3 is over - type x4 for the final level. 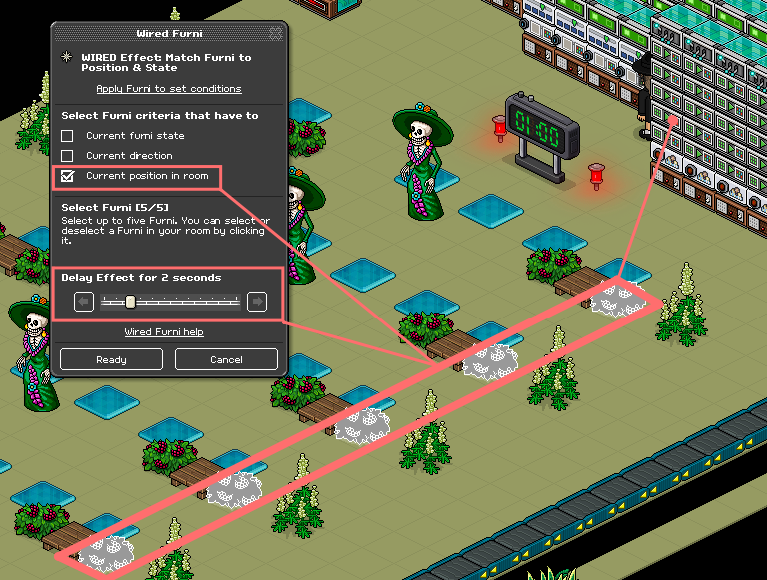 Follow the room layout exactly as shown below. 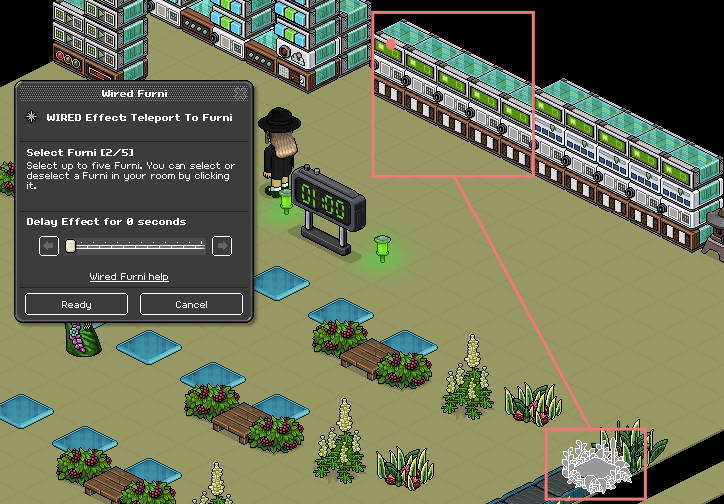 • Place all items as shown below within the highlighted area. 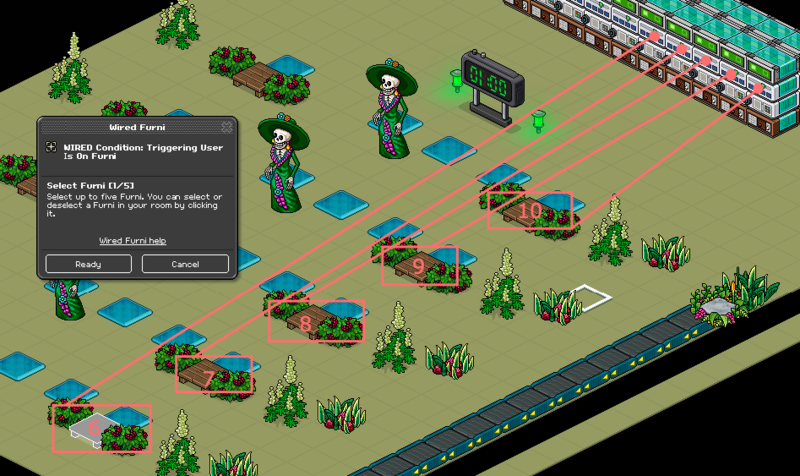 • Note that the only walkable item allowed is the stage they stand on. 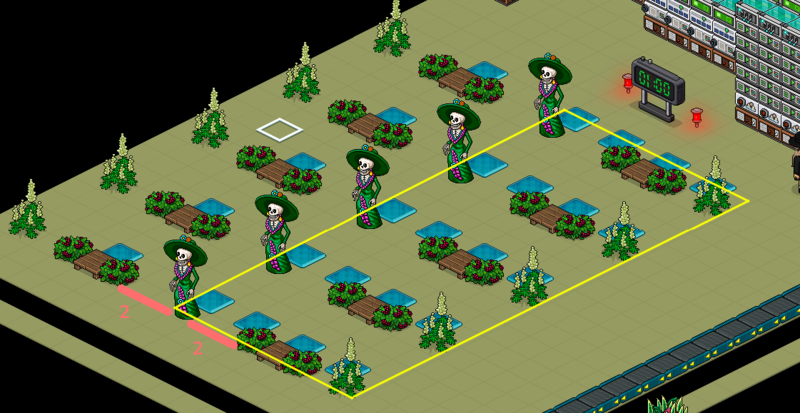 • The bushes must be an item that is stackable but not walkable. 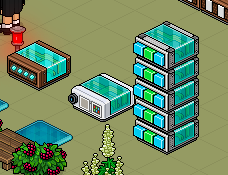 • The freeze tiles are important so place them all as shown below. • Don't forget your queue must be at least 3 space away from the game. • Leave a vast space for wired. Note that there is a heavy use for wired here, you may "short cut" some of the wired to instead of using 5 stacks to 1 stack. 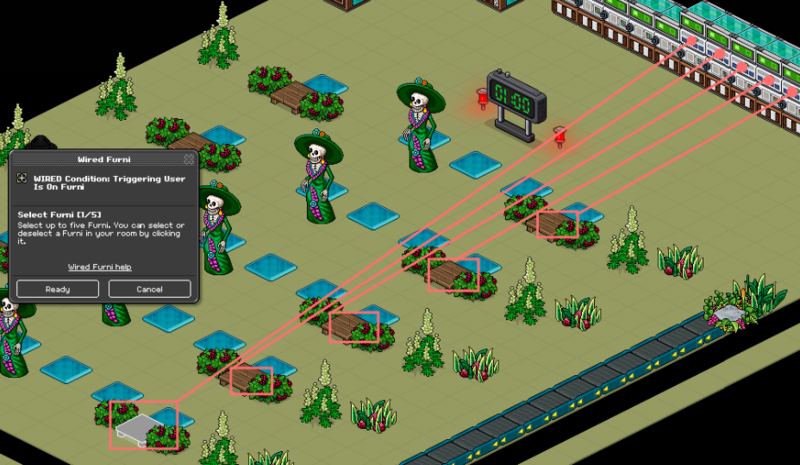 But the extra stacks are insurances for glitches. Set up the wired shown below. 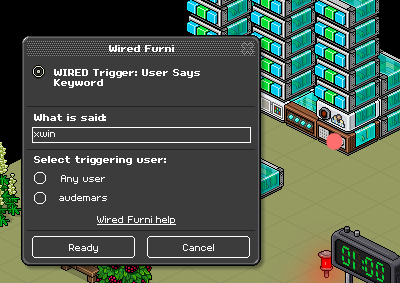 Select the first - Teleport to Furni. Select the first player's stage. 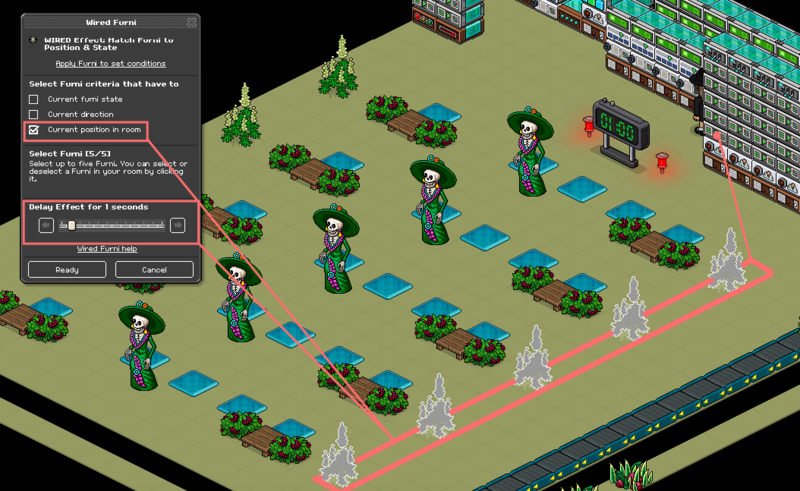 Then wire the rest of the player spots, follow the indicated numbers shown. 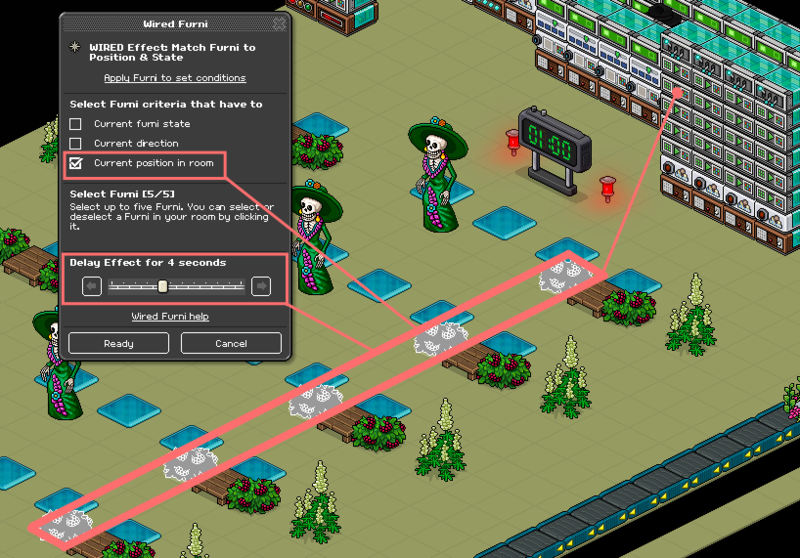 Then wire the rest of the match furni, if you're selecting the match furni the walk on must be on the next stack. 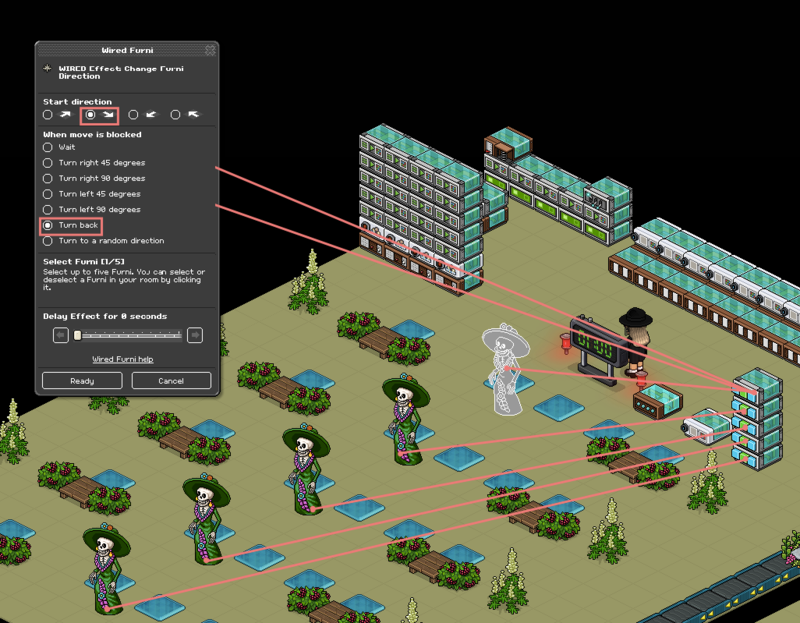 You must select the walk on (back to the first player stack) and the attic gate's state to closed as shown below. Select gate & patio as shown below. 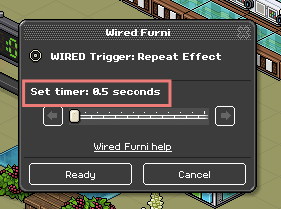 Select - Toggle Furni State and select the timer and set it to 10 second delay as shown below. Set up the counter with 2 slope lights as shown below. 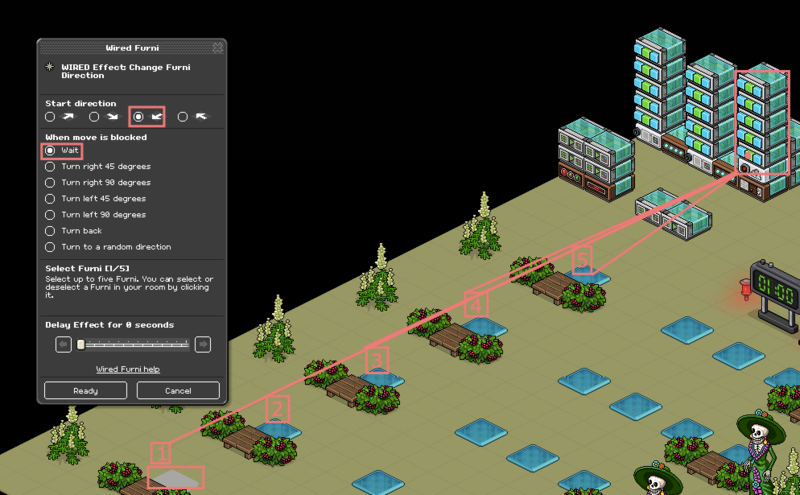 Select the first - Match Furni to Position & State and select the two slope lights shown below. Make sure the slope lights are green when you select them. 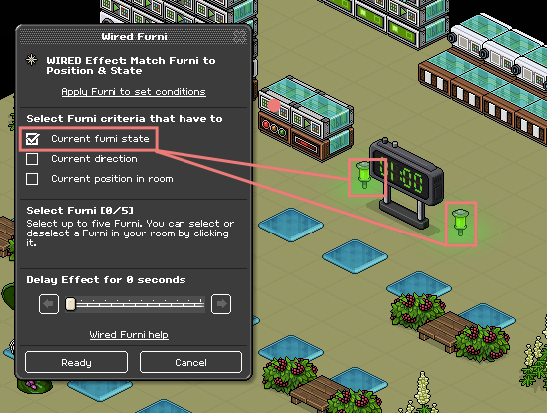 Select the second - Match Furni to Position & State and select the two slope lights shown below. Make sure the slope lights are red when you select them. 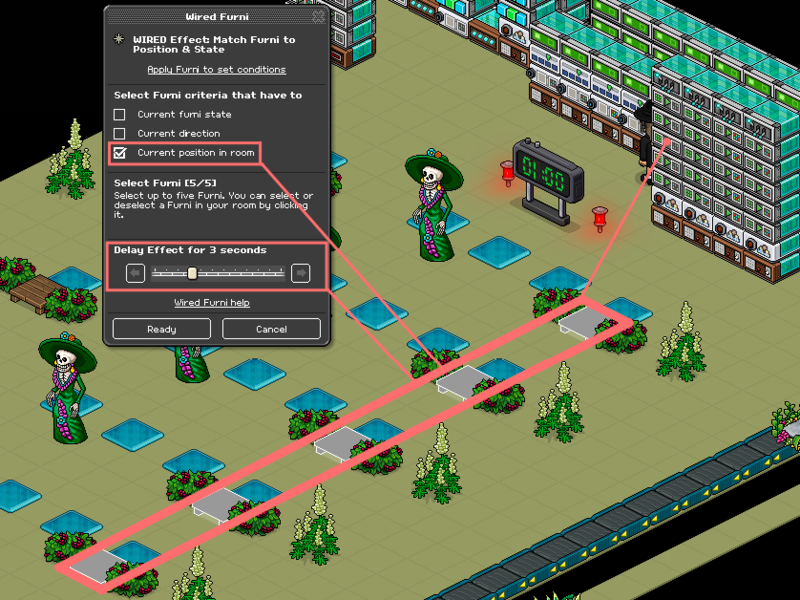 Select - Repeat Effect and set it to 0.5 as shown below. 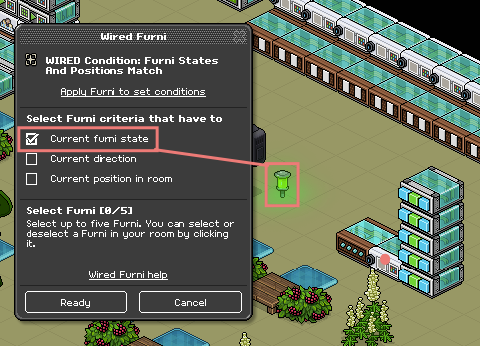 Select - Condition: Match Furni to Position & State and set it to the slope light shown below. 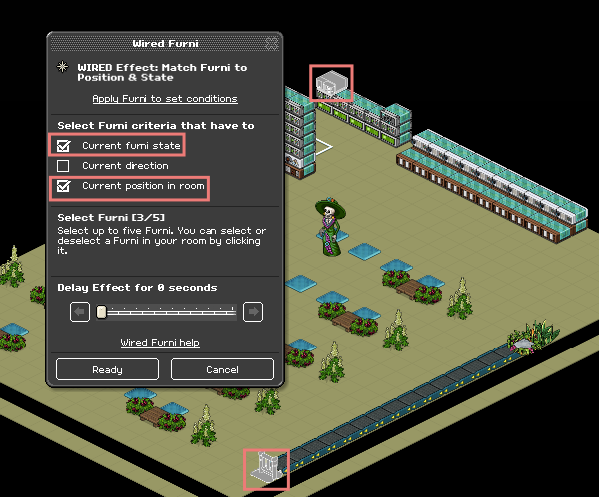 Select - Change Furni Direction, select the moving items shown below. Make sure it is set up as shown below. Now move the wired to a secure location. 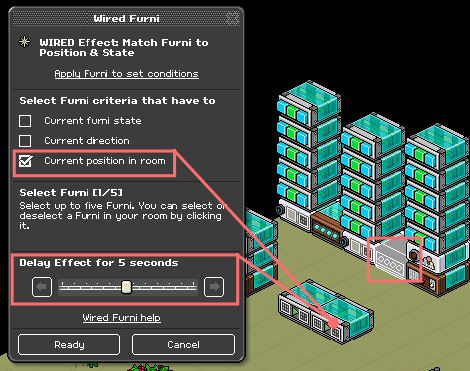 Add the two Match Furni to Postition & State to the game stacks. 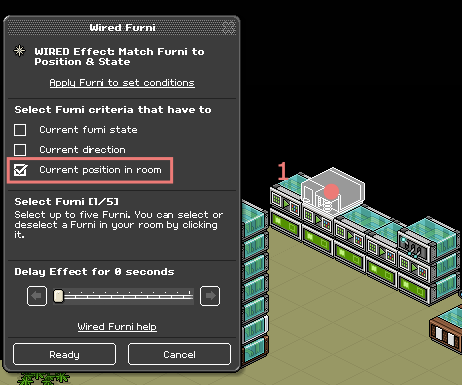 Select the first - Match Furni to Position & State. Make sure the repeat effect is on the stack shown below. 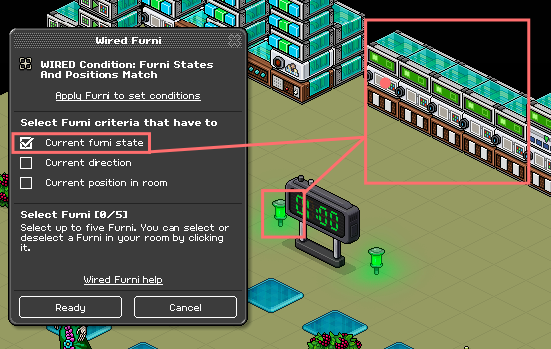 Select the second - Match Furni to Position & State. Make sure the repeat effect is in the spot highlighted below. Make sure you select the 1st Slope Light and make sure it's red. 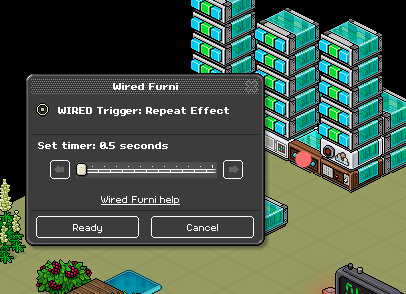 Select - Change Furni Direction and wire the freeze tiles. Wire all 5 rows to one wired each as shown below. Select - Repeat Effect and set it to 0.5. 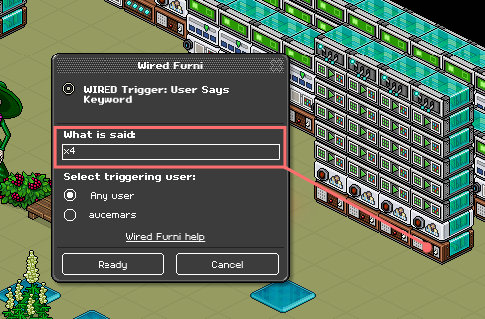 Select - User Says Keyword, and wire it to xwin as shown below. 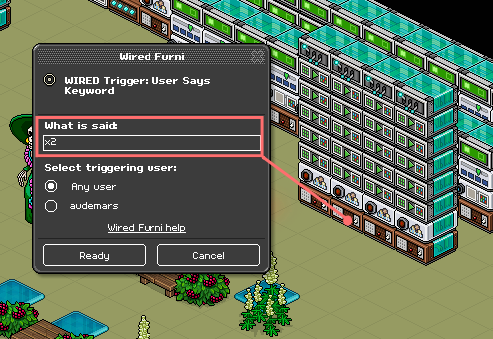 Select - Change Furni Direction and wire the freeze tiles shown below. Wire one tile to one wired each. 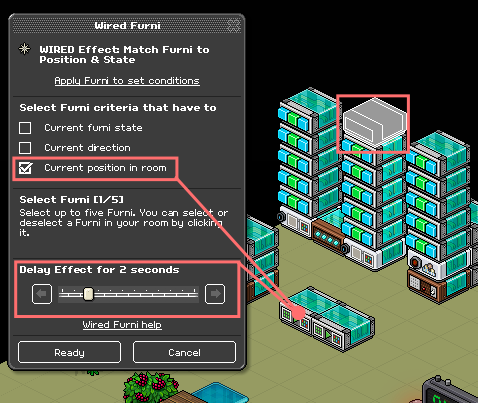 Select the first - Match Furni to Position & State and place the repeat effect on the position highlighted below. Make sure that the delay is 2 seconds as shown below. 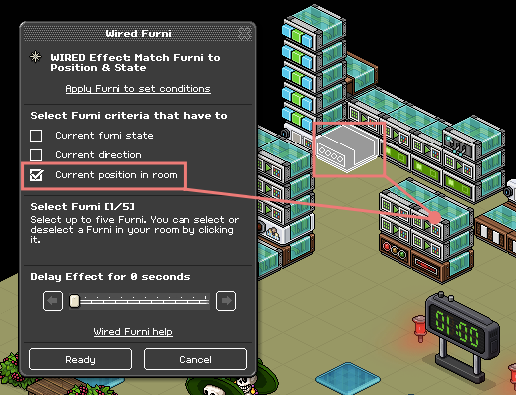 Select the second - Match Furni to Position & State and place the repeat effect on the position highlighted below. Make sure that the delay is 5 seconds as shown below. 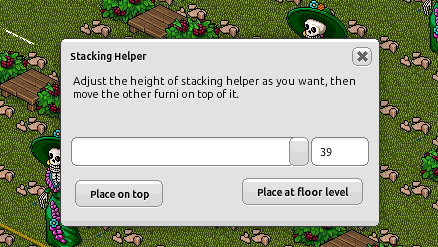 Now place both - Match Furni to Position & State to the game ends stack. 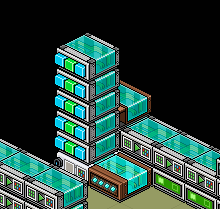 • 15X Condition: Match Furni to Position & State. • 10X Condition: Triggering User. 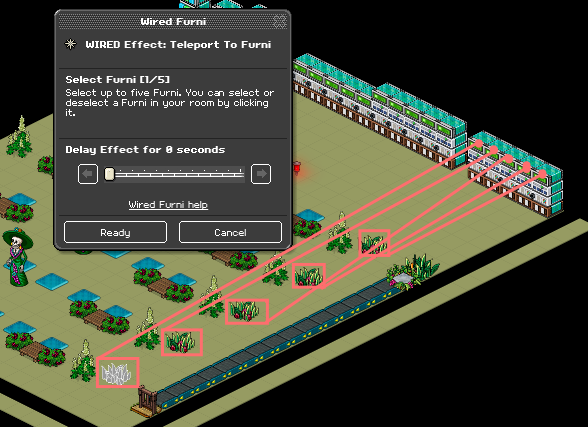 • 15X Teleport to Furni. 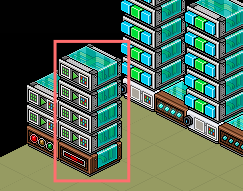 Note: You can reduce some of the duplicate stacks if you want but I've tested it works best. with the set up below for minimal to zero glitches. 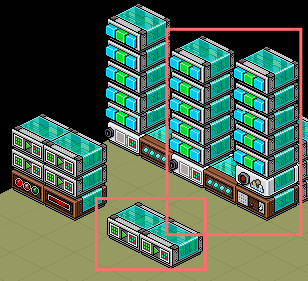 Set up the first 5 stacks shown below. 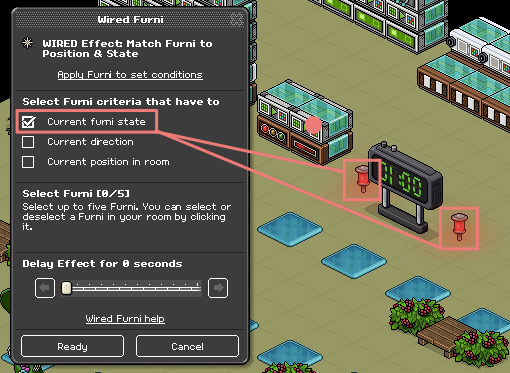 Select - Condition: Match Furni to Position & State. Make sure you select the 1st Slope Light and make sure it's green. 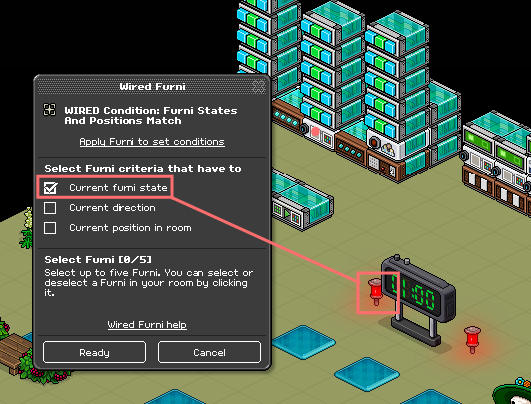 Select - Teleport to Furni. 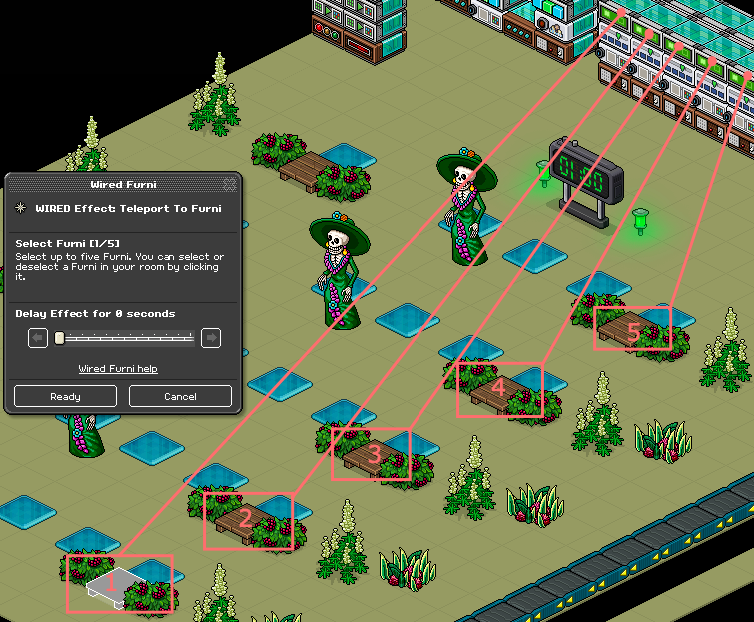 And select the spots where users tele to exit/when they're out of the game. For example to the back to the roller line. 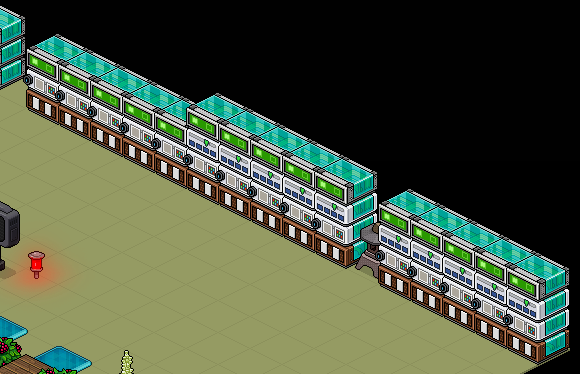 Set up the second 5 stacks shown below. 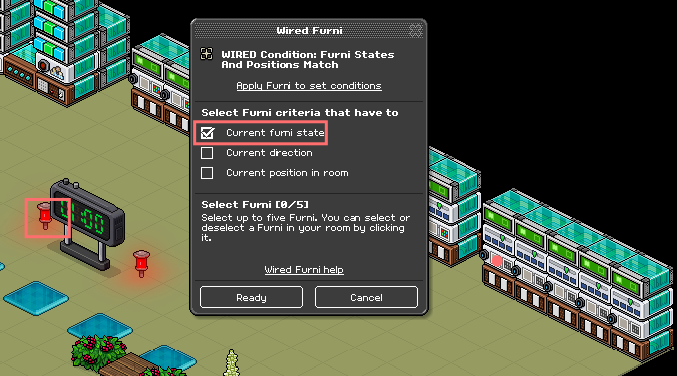 Select - Condition: Match Furni to Position & State, wire all 5 of them as shown below. 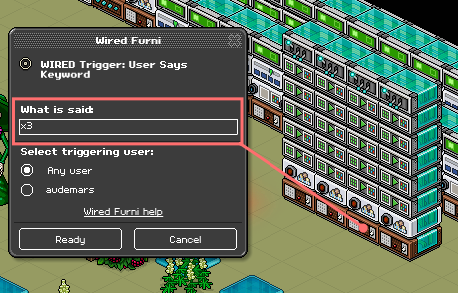 Select - Condition: Triggering User. Wire all the 5 stages on the right. Wire it to the corresponding stages on the left. Set up the third 5 stacks shown below. Wire all the 5 stages on the left. 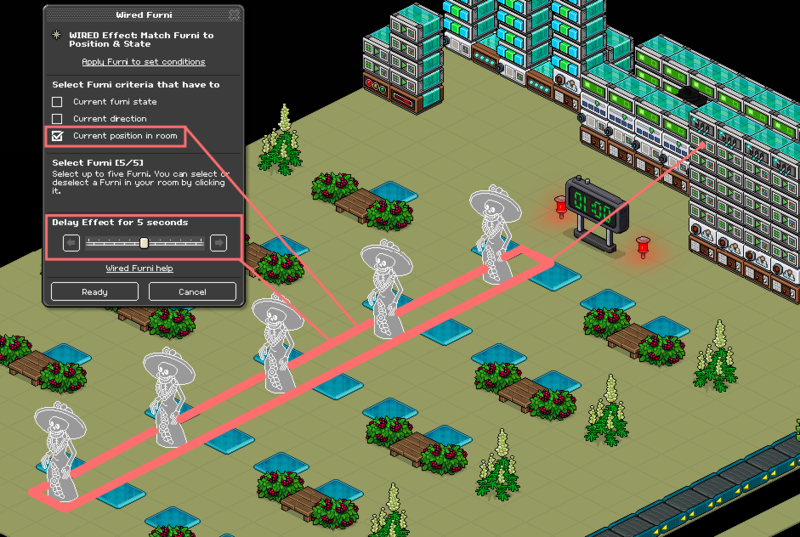 Wire it to location where winners tele after each game, try 5 different spots so it's easier to trade them prizes. • 10X User Says Keyword. • 10X Condition: Match Furni to Position & State. • 10X Teleport to Furni. Select - Users Says Keyword. 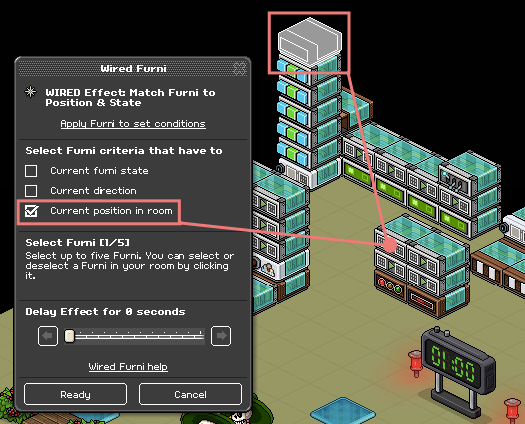 Wire all of the key word to "jump"
Select - Condition: Match Furni to Position & State, wire all of them as shown below. Make sure you select the 2nd Slope Light and make sure it's green. And wire it to the 5 stages on the left. And wire it to the 5 stages on the right. • 4X User Says Keyword. 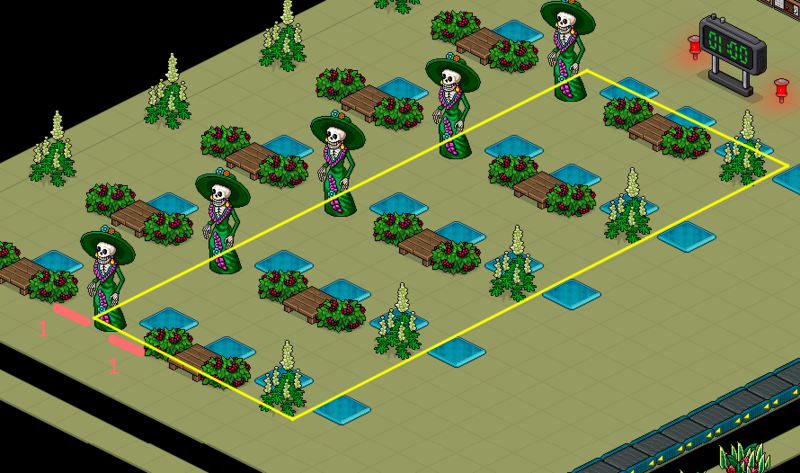 • 20X Match Furni to Position & State. 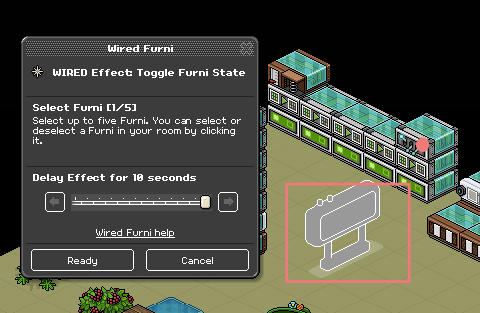 • 3X Toggle Furni State. 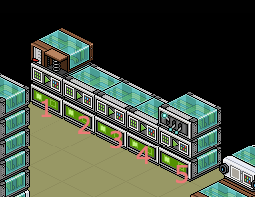 You must follow the layout exactly below, we will be moving the items in the highlighted box shown below. 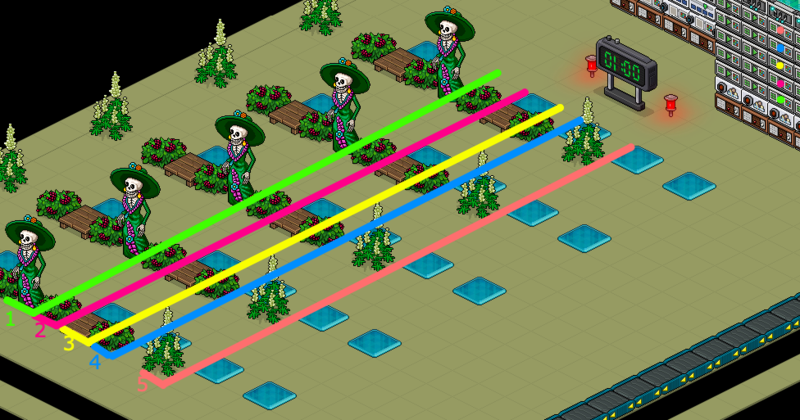 Note that there needs to be 3 spaces apart between the bush and catrina on each side. Select - User Says Keyword and set it as shown below. 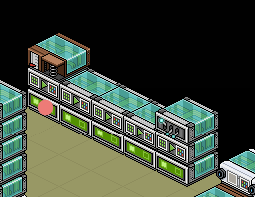 Select - the first Match Furni to Position & State. Wire all the lupines as shown below. Make sure it is delayed at 1 second. 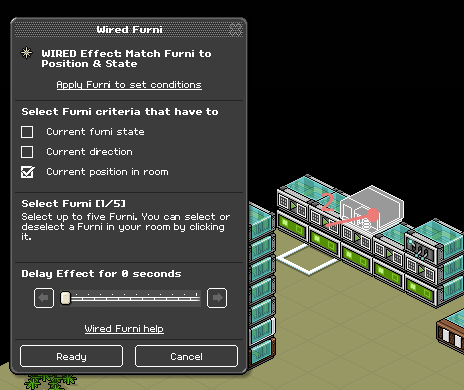 Select - the second Match Furni to Position & State. Wire the bushes as shown below. Make sure it is delayed at 2 seconds. Select - the third Match Furni to Position & State. Wire the stages as shown below. Make sure it is delayed at 3 seconds. Select - the fourth Match Furni to Position & State. Make sure it is delayed at 4 seconds. 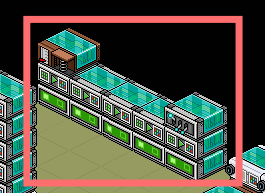 Select - the fifth Match Furni to Position & State. Wire the catrinas as shown below. Make sure it is delayed at 5 seconds. NOTE: There's NO toggle on this stack (reset stack) I accidentally put one in the screenshot. 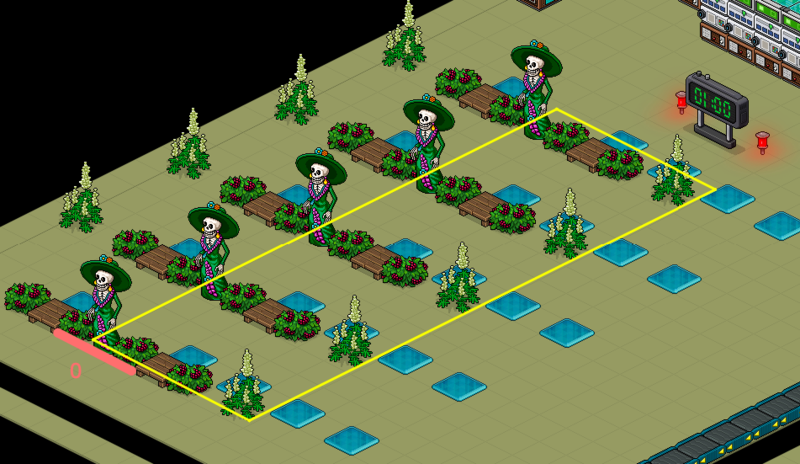 Note that there needs to be 2 spaces apart between the bush and catrina on each side. 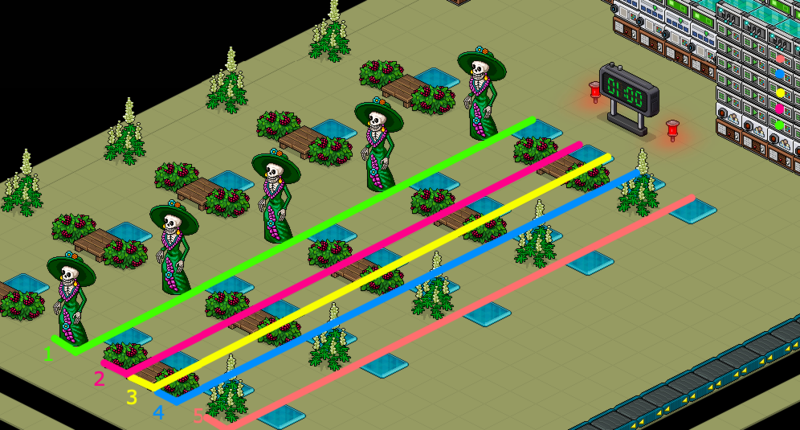 Wire - the Match Furni to Position & State the same as in Step 8A but starting with the Catrina this time. 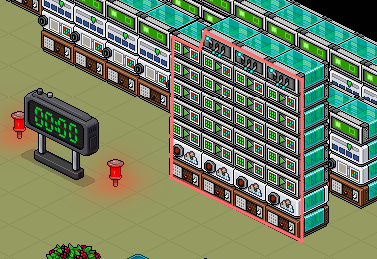 This is the end of the 2nd Level/Stack. 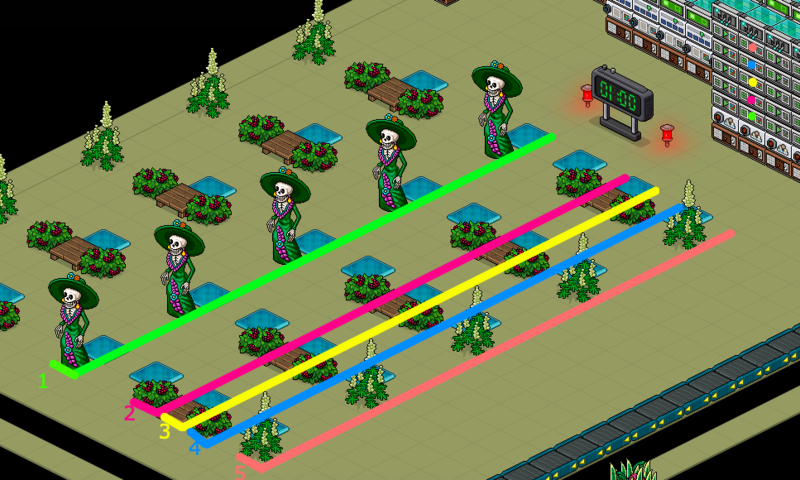 Note that there needs to be 1 spaces apart between the bush and catrina on each side. 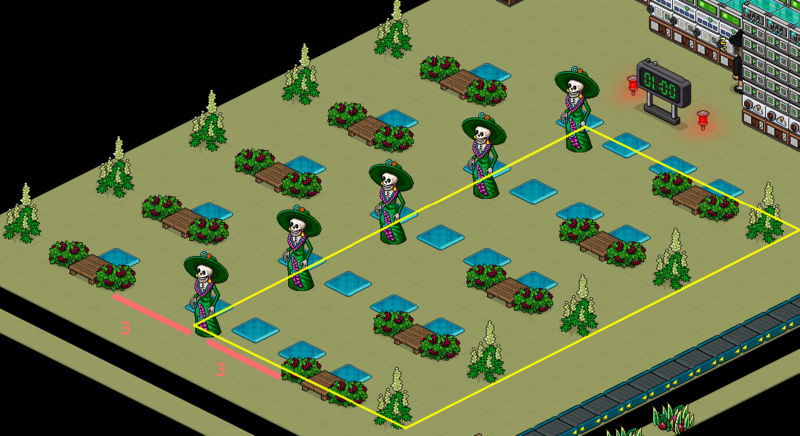 This is the end of the 3rd Level/Stack. 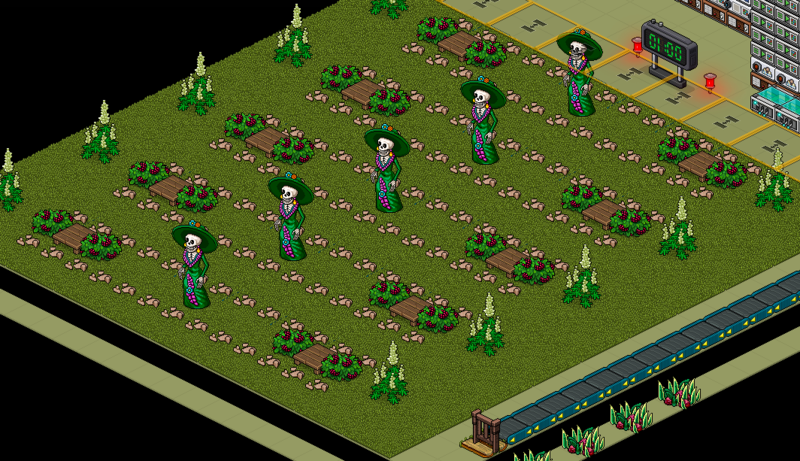 Note that there needs to be 0 spaces apart between the bush and catrina on each side. 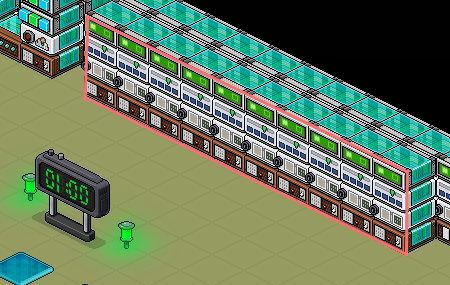 This is the end of the 4th Level/Stack. Place your floor that covers the freeze tiles, you can pick any floor you like. Now place the rocks/ducks (something unwalkable preferrably) as shown below. Stack the rocks at 39 on your stack tile. 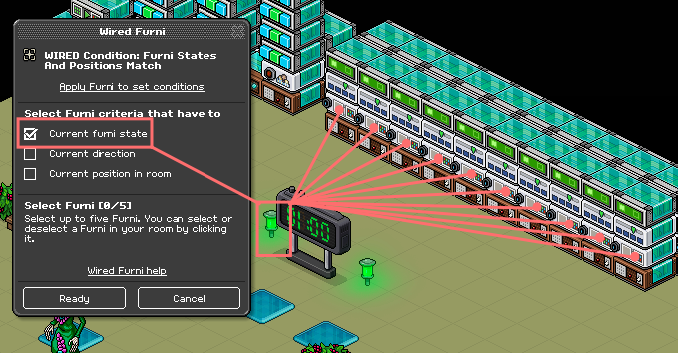 • Once the last person enters the game, the timer will start in 10 minutes and the game will begin. • When the fourth round ends (game ends) type xwin to teleport your winners. 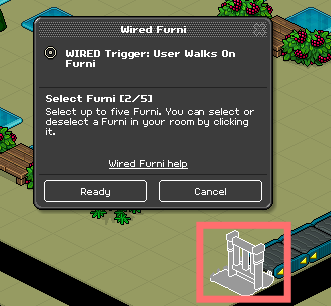 • They will teleport to the items you wired in Step 6. • Reset the game before you start the next game. Good luck if you have any questions, leave it in the comments.